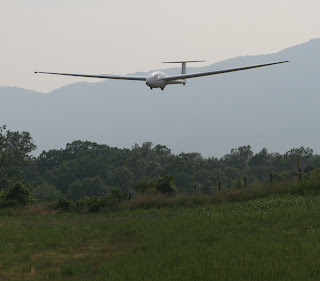 On Wednesday morning, 20 July, I took the practical test for my glider rating in 97°F heat. The high density altitude and tailwind on takeoff made the rope break maneuver on the second flight interesting. Overall, I was disappointed with my performance. I flew sloppily, but everything was within PTS and certainly safe. I never seem to be at my best during a checkride, and I suspect that lack of sleep the night before was a contributing factor. I am so happy to have earned this rating. Now I can start learning how to better keep the glider aloft and actually go places. I have begun reading Helmut Reichmann's wonderful Cross-Country Soaring (Streckensegelflug) which recently went back into print. On Friday, I went to the field to help crew for another club member's checkride and hadn't planned to fly due to the oppressive heat and humidity. 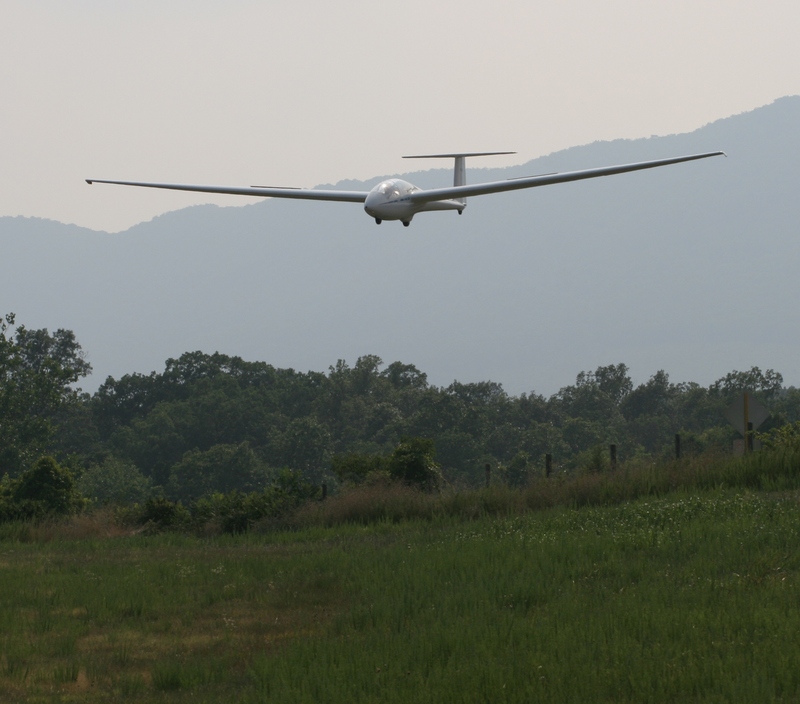 Cu's were popping, though, and when the opportunity arose to make the put-away flight in the Grob 103, I jumped on it. A fellow club member was brave/crazy enough to hop in back as my first passenger and we launched. After tanking up in a few good thermals north of the airport we went sightseeing. It was cool to cruise along Skyline Drive near Linden VOR at 75 knots. As a solo-endorsed student, I was advised not to stray too far from the airport, and it felt good to finally be free of those restrictions. We managed to get a solid hour of flying in and had to pull the spoilers to get down.